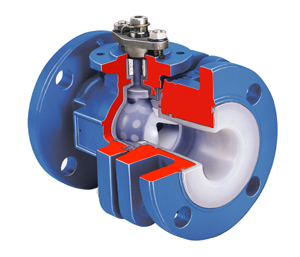 In addition to the features and benefits that have made it the process industry’s most preferred lined ball valve worldwide, Flowserve Atomac offers the V-port ball valve for precise modulating control services. Now you can achieve precise control of aggressive products without the expense and long deliveries of exotic alloy valves. Atomac V-port valves are available in 1 in., 1 1⁄2 in., 2 in., 3 in., 4 in., and 6 in. sizes and in models AKH2, AKH2A, and AKH3. Refer to Sections II and IV of the Durco Technical Manual for valve and actuator sizing. ISO 5211 mounting pad facilitates actuation. All wetted parts are inert fluoropolymer resins.